As the oldest American settlement west of the Rockies, Astoria offers a rich history for your exploration. It was first visited by Captain Robert Gray in 1792, by the Lewis & Clark Corps of Discovery in 1805, then adventuresome pioneers by the thousands. Now its your turn to experience the excitement of exploring Astoria. 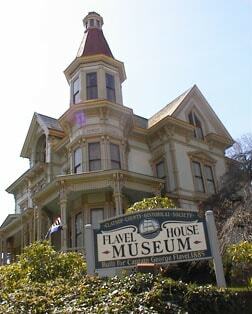 Within a 20 mile radius, one can see dozens of exciting attractions including Fort Stevens State Park, Fort Astoria, Heritage Center Museum, Flavel House Museum, Uppertown Fire Fighters Museum, Astoria Column and the Columbia River Maritime Museum, home to one of the nation's finest displays of model ships and nautical artifacts. Astoria offers other fun discoveries, such as historic Victorian homes and the beautiful 4.1 mile-long Astoria Bridge. Built in 1926, this 125-foot tall structure sits atop Coxcomb Hill, Astoria's highest point. The 164-step climb up to the observation deck offers majestic views of Astoria, the Pacific Ocean and Cascade Range. Spanning 84 years as a military defense installation, this Civil War-era fort was fired upon during WWII by a Japanese submarine. Today, the Park offers 3,700 acres of history and beauty. Wreck of the "Peter Iredale"
The remnants of the four-masted sailing vessel ran ashore near the mouth of the Columbia River in 1906. Abandoned near Fort Stevens, the wreckage can still be seen. Home to one of the West Coast's most astounding collections of nautical artifacts, the Museum displays 24,000 square feet of exhibits including a remarkable floating lighthouse called Columbia. Built in 1885, this lovely home is one of the best-preserved examples of Queen Anne-style architecture in the Northwest. Its decorative exterior distinguished by a fourth-story cupola was seen in the movie "The Goonies." Surrounded by the rugged natural beauty of Oregon's forests, ocean beaches and rivers, this charming coastal village is famous for Haystack Rock, a 235-foot tall rock formation that rests off shore. Nestled in the verdant forests and wetlands of the Coastal Range, this 50-foot by 50-foot structure is a stunning replica of the seven-room fort built by members of the Lewis and Clark expedition. Called "the little town with the million-dollar view," this charming little village sits on the edge of a beautiful bay, surrounded by lush, green hills that offer refuge from the prevailing Northwest wind and fog.